Daisuke Matsuzaka leaves New York to find out if he can still be Big In Japan. Dice-K signed a contract to play for the Softbank Hawks of Japan’s Pacific League in 2015. I still remember how shocking it seemed for the Red Sox to pay a $51M+ posting fee simply to negotiate with Matsuzaka, and then paid another $53M for his services over six years. The numbers were mind-boggling. Today, the posting fee remains absurd, but a 6/$53M deal for a middle-of-the-rotation starter isn’t so bad. By the way, do you remember that Matsuzaka wasn’t yet known as “Dice-K,” but rather, “D-Mat”? And way back in 2006, when buzz about the Japanese hurler coming to the USA was swirling, MetsToday was not so hot on him, going so far as to quell the hype around him, and building suspicion based on all the info available. A few months later, anticipating D-Mat’s arrival in the USA, MetsToday wondered if the Japanese pitcher would challenge Kobe Bryant to a one-on-one? Or, rather, would he stimulate a new food sensation? In any case, say goodbye to Dice-K as he returns home. The bullpen will once again be a lonely place between the first and fifth innings. It was a shame that he got hurt before he could really peak in the U.S. When he first came over here, his stuff was electric, but he nibbled like crazy. He slowly started throwing more strikes, but then injuries depleted his arsenal. Watching him last year was kind of like watching an erratic Bronson Arroyo. Great job keeping hitters off balance with different breaking balls, but not much on the fastball, and too many walks (as opposed to Arroyo, who arguably throws too many strikes). I’d be curious to see if he gets back on the Japanese system of throwing constantly, and starts throwing 150 pitches in games every 7 days without injury. I doubt we’ll be privy to that kind of info, but it’ll be fun to check out an innings total, at least. His effectiveness should also tell us something about NPB vs the NL in 2014-2015.
oh DAMN … good call, Bunnies. And I’m a Tom Waits fan, I should know better. Mets fans owe a debt of gratitude to Dice-K. He started, he relieved, and he even closed a couple of games proving he was willing to do whatever Terry and Dan could throw at him. Sure his numbers were mediocre and you scratched your head sometimes, but he was effective. Not to mention affordable, as a direct result of his fall from grace. 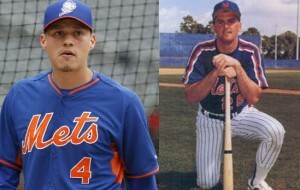 In sum, Dice-K was a classic Mets move to sign a fading superstar, but in this case it was not a total Foster. I mean, disaster. I mean, Mo Vaughan . . .